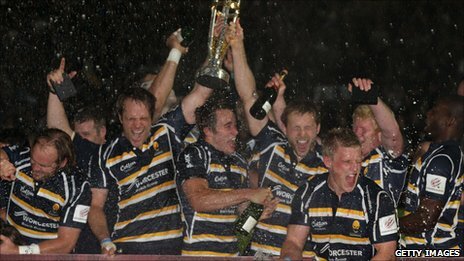 Worcester returned to the Premiership - and relegated Leeds from it - with a 25-20 win over Cornish Pirates in the Championship final second leg. The hosts answered two first-half Rob Cook kicks with a Marcel Garvey try and eight points from Andy Goode. After the break tries by Miles Benjamin and Goode put Worcester 25-6 ahead before Drew Locke pulled one back. Pirates fought hard and won a penalty try, while Neil Best was in the sin-bin, but Worcester held on. The result confirms Leeds' relegation from the Premiership and means the Warriors go straight back to English rugby's top-flight after only one season away. Worcester were defending a 21-12 advantage from last week's first leg at Mennaye Field but were aware the only defeat in their 31 Championship games was at home to the Pirates in October. 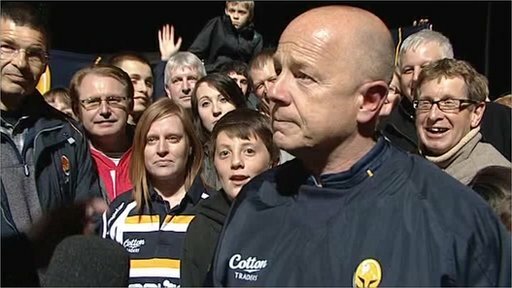 The visitors threatened to spoil the carnival atmosphere in a packed Sixways with virtually the first play when Cook converted a second-minute penalty after Greg Rawlinson got in front of Jonny Arr's box-kick. A second Arr kick ahead, and ensuing turnover, allowed Goode to level the scores on five minutes. Worcester's dominance in the set piece was evident early on and a five-metre scrum, in which they pulverised the Pirates, allowed Garvey to dart over from close in. Goode added the kick to make it 10-3 just before the quarter-hour mark. More rock-solid platforms and quick ball ensured the Warriors were comfortably on top in the first half, while Pirates struggled to engineer opportunities, as Goode struck a drop-goal to give the Warriors a 10-point cushion. Effervescent fly-half Jonny Bentley almost went in for the Cornishmen on 25 minutes when he ducked, feinted and stepped to within yards of the line only to be caught by Garvey. The Pirates were dogged by errors, particularly at the line-out, but on 34 minutes they finally produced a set play, which earned them a second penalty, converted by Cook, to make it 13-6 up to the interval. Benjamin's try two minutes after the break, converted by Goode, and Goode's own try three minutes later looked to have sealed the tie. Warriors' fly-half missed the conversion but it was of little consequence with the score at 25-6, 45-18 on aggregate, and the home side coasting. But a short-side break by Bentley put Locke away to round off a great Pirates counter-attack after a Goode penalty attempt came back off the posts. Encouraged by their try Pirates upped the tempo and after cutting their line-out enjoyed greater possession and began to find space to attack. The visitors pressed hard for another score and after Best was sent to the sin-bin with seven minutes remaining referee John Paul Doyle awarded a penalty try for an infringement at a five-metre scrum. Pirates refused to lie down and strived for another try but it proved just beyond them. "At 25-6 I was bit relaxed, and I think some of the players were as well. "We were well in control of the game but the Pirates, true to form, came back at us every time we played against them. They made it very uncomfortable for us in the last quarter of an hour. "Good luck to Leeds coming down to this league because it is tough, it's hard and we are relieved to get out of it. "It has been a battle every week." "I'm extremely proud of the way the guys stuck at their task as we'd made really hard work of it for ourselves, not taking anything away from Worcester as they thoroughly deserved the victory. "We made a lot of errors early on which let them get ahead of us, but we fought, and to have two tries scored against you second half and still come back into the game, I'm just extremely proud of the players. "If we play well enough to get ourselves into this position at the end of next season, we will be a far better side for it and we will understand some of the things that went wrong over these two legs and how to put them right." Worcester: Pennell; Garvey, Grove, Rasmussen, Benjamin; Goode, Arr; A Black, Fortey, Taumoepeau; Rawlinson, Gillies; Best, Abbott, Horstmann. Replacements: Lutui, Douglas, Kitchener, Balding, Frost, Carlisle, Crockett. Cornish Pirates: Cook; McAtee, Hopper, Locke, Jackson; Bentley, Cattle; Rimmer, Elloway, Storer; Myerscough, McGlone; Marriott, Burgess, Morgan. Replacements: Andrew, Ward, Paver, Nimmo, Betty, Doherty, Luke. Ref: John Paul Doyle (RFU).